Start seeking opportunities as soon as possible — maybe before you feel ready! It’s going to exponentially increase your success because of the compounding effect. The first years can be slow, so the more projects you have, the more experience you’ll have to leverage. As part of my series featuring the rising stars in the music industry, I had the pleasure of interviewing composer Marc Jovani. 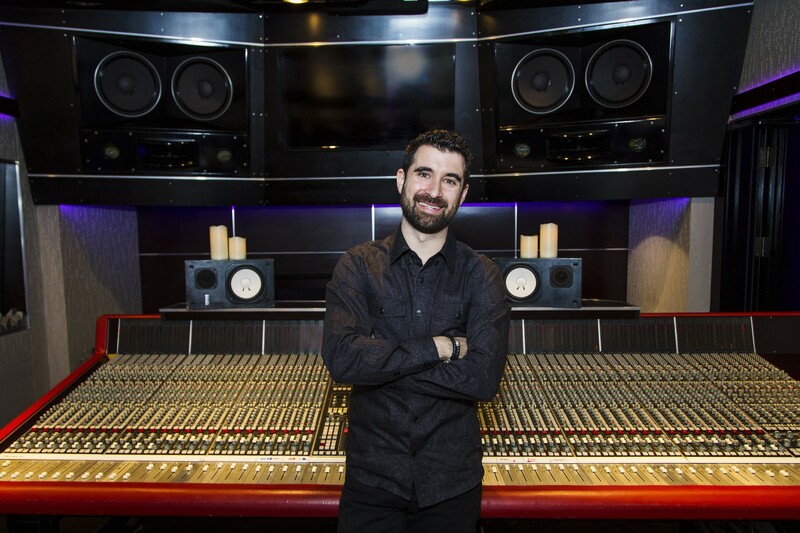 Marc is an International film and television composer currently residing in Los Angeles. Born in Spain, he mastered music early and graduated first in his class from the Superior Conservatory of Castellon before attending the renowned USC Scoring for Motion Pictures and Television program. Since then, he’s worked on projects for networks and studios including Lionsgate, Syfy Channel, Fox, HBO, NBC and Netflix; and internationally for series airing in France, Italy, and Spain. Thank you so much for joining us Marc! Can you tell us a story about what brought you to this specific career path? When I was studying composition at the Castellon conservatory, I was in my last year of studies and my teacher noticed that my compositions had a “Hollywood” type of sound. In Europe, especially in the classical conservatory setting, they don’t always like this, but I was doing my thing. I had a teacher that wasn’t opposed to the sound and would tell me, “you’re good at this type of music!” One day he told me — and I’ll never forget what he said — he said, “You should check out the Film Scoring program at USC. That would be a really good fit for you.” I immediately looked up the program and USC and I knew it was exactly what I wanted to do. I went home that day and gave one of the most convincing speeches of my life as I convinced my parents that I should go to LA for this program. At the time, the tuition for one year was around $40,000 and we didn’t have that money, so I had to figure out a way. I ended up getting a scholarship that paid for a big percentage of the tuition and that’s how it started. When I was in Spain, studying at the Conservatory, I used a variety of production tools and techniques to make my compositions sound as good as possible; using samples and libraries and a sequencer, for example. No one else was doing that, and I was used to being unique. When I came to USC, all of a sudden I was in a class with 20 other talented young composers. There was so much competition! I spent the first semester trying to compete and getting frustrated. There was a turning point when I went home to Spain for Christmas when I realized, knowing my student visa would expire at the end of the program, that the goal was no longer to be the best in the class, it was to find projects to score. Then we had a class with Richard Kraft, one of the major agents in Los Angeles, and he spoke about how to find projects. It was exactly what I needed at that moment and I listened to everything he said. He laid out a great strategy (though it doesn’t work quite the same these days) which was to go to IMDB, look up directors an movies they’re working on and call them and offer your services. The assignment was to call a list of contacts and get a project. I was the only one who did the assignment. I knew it was the key despite it being hard. I began calling every day after class. I got very ambitious and started calling production companies. During the last three months of the program at USC, I made thousands of calls and got thousands of no’s. Finally, as we were approaching the end of the program, I received an email. Funny enough, it was from the very first production company I called. The call landed me a TV movie and I ended up doing six films with the company. That single call changed the course of my life and began my career working as a film composer in Hollywood. It was so great to be part of the incredible team working on a new thriller, “My Daughter’s Ransom” (Lifetime.) It was produced by Robert Ballo and written and directed by Doug Campbell. Andres Boulton was the sound designer and sound mixer and I’m really proud to be part of this project. I’m also co-founder on Cinematic Composing, which is an online music school. We recently developed a new course called Hollywood Systems Secrets Masterclass. The course teaches composers how to market their services to find projects, and is the culmination of my 10 years of experience working in the industry. I think that’s a fantastic question. At the end of the day, as a composer, I’m an entrepreneur. And as an entrepreneur there are peaks and valleys. The goodness I’ve brought has actually come from my struggles in particular moments. In 2010, I went back to Spain for family reasons. As a composer, it can be hard to keep working if you’re not in physically in Los Angeles. Back in 2010, producers weren’t as keen to do Skype meetings. Slowely, I started losing some of my projects. My wife and I decided to move back to L.A., so we both started teaching in Spain to save extra money and I was also teaching at Berklee Online. When we returned to LA, things were very tough. I was still teaching at Berklee, but I had a few months where I just wasn’t getting composing projects. I had lost the momentum I had had previously. Meanwhile, I had developed a new course for Berklee but wasn’t immediately able to implement it. With the cost of living in LA, our savings wasn’t going to last forever. It seemed like everything was going wrong. It was in that moment that my wife and I decided to launch our own online course. We invested the very last of our savings into developing and launching the course, knowing that if we failed, we would have to go back to Spain. We launched it and enrolled 32 students on day one. That’s how Cinematic Composing came to be and we now have over 1,000 students learning and growing their careers with us. It can be a struggle to succeed in the film industry. There are more options than there were 10 years ago with digital and streaming services, but the budgets have gone down and the amount of people in the industry has increased. The ways in which things are done are different than they were 10 years ago. We have over 1,000 students in Cinematic Composing and I meet with groups of them every week. The biggest struggle for them is getting projects. So, at the moment I’m on a mission of giving them the tools so they can actually find a job for themselves and start creating a career. Not just a few marketing tricks, it’s about them becoming business owners. At the end of the day, a film composer is a service provider and you have to secure your business to go through the ups and downs that are normal in business. As a film composer there are are a couple paths people tend to take. One is to start by being an assistant that helps a composer who’s already ahead of you. At some point if you’re lucky, they may give you an opportunity. If you go this route, I would recommend assisting someone who is miles ahead of you, not just a few steps. The kind of project you’ll hopefully get as a loyal assistant will be much better and worth you investing years of your time helping them grow their career. The other path could be growing your own career from the beginning and taking smaller projects that will lead you to bigger projects. This is what I did. But with this path, you’ll have some ups and downs, so you’ll need to have an additional income stream (aside from composing) for 5–10 years. It may sound like a lot, and maybe you can do it in less time. But be sure to secure your life and not to just make ends meet, but also save for the future. If something goes wrong, you don’t want to lose momentum in your career, so plan ahead and have some savings. No matter which path you take, treat yourself as a real business from day one and put all the systems together. Not just your website and music, but your communication, branding, your elevator pitch, and how you present yourself. First thing is that if you stop working for awhile, when you go back you’ll have to start from scratch. Be careful not to get burnt out because it will take twice the amount of effort to come back. Second, I wish someone had told me to treat myself as a business and not just a composer. The sooner you start presenting yourself as a professional, the more work you’re going to get, It’s about building trust. The bigger projects you get, the more trust you need to show. Third, start seeking opportunities as soon as possible — maybe before you feel ready! It’s going to exponentially increase your success because of the compounding effect. The first years can be slow, so the more projects you have, the more experience you’ll have to leverage. The fourth thing would be don’t be afraid to build new beliefs. My old belief used to be that I need to be working all the time, and if I don’t, other composers will get more projects than me. But if you take moments to think and be present, you’ll come up with better ideas. It may not be about putting in 10 extra hours. It may just be slowing down and getting an inspired idea to reach out to have a meeting with someone that ultimately moves you ahead 10 times faster. And last, don’t be afraid to ask for help. You know, sometimes we don’t think it’s polite to reach out to a friend and say, “Hey I want to work on xyz project — can you connect me with this person?” We don’t want to be too direct or intrusive. But this is sometimes what can help you and you just have to ask — before someone else does.